Sales & Lettings Angels are thrilled to offer this house on Glynrhondda Street. This spacious 11-bedroom house has 3 bathrooms and is available from the 1st July 2019 for 350 per person per month including all bills - gas, water, electric and internet. This house would be perfect for students, but the landlord unfortunately can't accept any children or those on universal credit or assisted payments. The ground floor of the property consists of a large open plan kitchen and living area which is extremely spacious and light. The living area comes with corner sofas, and the laminate floor is easy to keep clean, so there are no worries if anyone spills anything! The kitchen area of the open plan area has been recently refurbished and is modern and fitted with plenty of cupboard space. 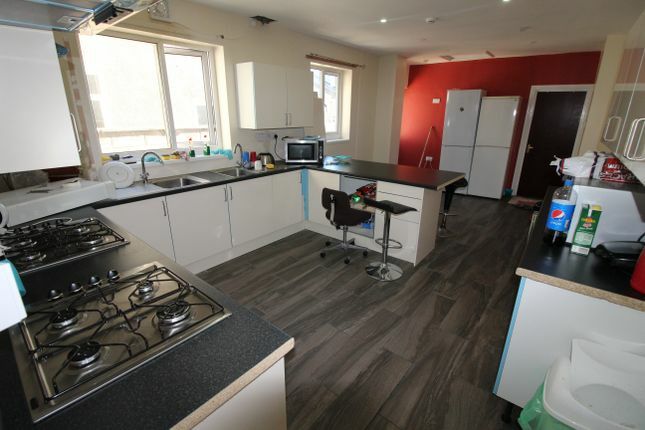 This kitchen comes with all the appliances you will need- two gas hobs with electric ovens, two extractor fans, two large fridge/freezers and a microwave! There is also a breakfast bar- meaning this area is the perfect area to socialise and eat with friends! This area as a whole is perfect for a group of 11! The ground floor of the property is also home to a utility room where you will find a washing machine and tumble dryer! There are 11 bedrooms in the property all of which are a very good size. The rooms come with a double bed, wardrobe, desk and desk chair. All rooms are extremely light and are supplied with a mirror! 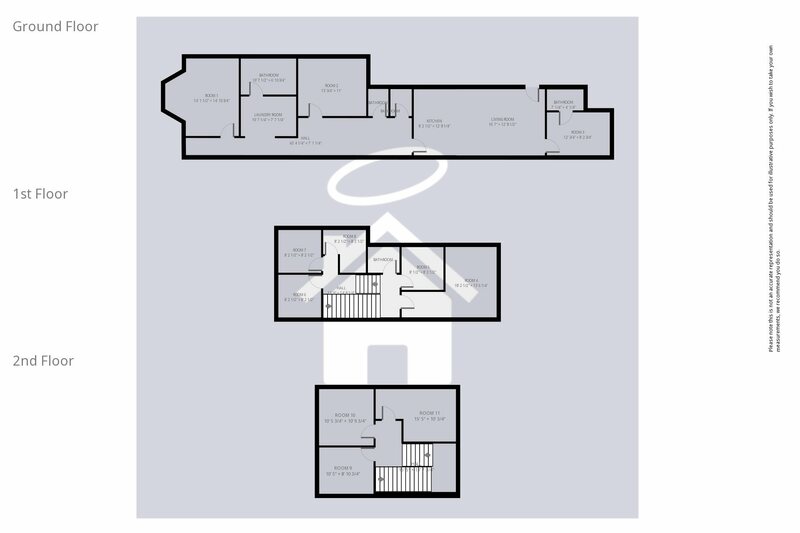 The first 3 bedrooms can be found on the ground floor, with the next 5 bedrooms found on the first floor and the remaining 3 bedrooms on the second floor. There are three modern, tiled bathrooms in this property. One comes with a bath and a shower, and the others have showers. They all also have a WC and wash basin. Room 3 at the rear of the property has its own bathroom making it an en-suite room! This property also has a small outside space, which would be ideal if you want to store a bike, or sit outside in the summer! Glynrhondda Street itself is the perfect choice if you want to live in the heart of Cathays. Salisbury Road is just a 2-minute walk away, where you will find all the amenities you will need from Tesco Express to get all those food essentials, to takeaways for the end of a night out in the town centre (which is only a 12-minute walk away- no need for taxis)! Fancy a drink? The Students Union is right on your doorstep, and pubs including Kokos, Gassy Jacks and the Vulcan are just a short walk away. It is just a 6-minute walk to Cardiff University?s main building, so you can roll out of bed and into those 9am lectures! For the more studious type, the Arts and Social Studies Library (assl) is just an 8-minute walk away- perfect for those late night study sessions. And should you want to go home for the weekend, Cathays train station is just a 4-minute walk away! This 11 bedroom, 3 bathroom property, suitable for both students or professionals, is available 1st July 2019 at only 3850 per month. Please note that only tenancies beginning on 1st July 2019 will be considered. The rental period if for a minimum of 12 months, suitable for the 2019/2020 academic year. Sales & Lettings Angels are unable to supply a tenancy for anything less than 12 months. The deposit will be 350 per person. If you are interested in this property, please call one of our Angels on or email and we can arrange a viewing appointment for you. - A UK based guarantor earning over 18,000 per year. If a UK based guarantor is not available, other options are available. Property descriptions and related information displayed on this page, with the exclusion of Running Costs data, are marketing materials provided by Sales & Lettings Angels, and do not constitute property particulars. Please contact Sales & Lettings Angels for full details and further information. The Running Costs data displayed on this page are provided by PrimeLocation to give an indication of potential running costs based on various data sources. PrimeLocation does not warrant or accept any responsibility for the accuracy or completeness of the property descriptions, related information or Running Costs data provided here.